Carphone Warehouse says it is mulling plans to spin off its TalkTalk internet and phone business, which launched in 2003 and now has 2.8 million customers. 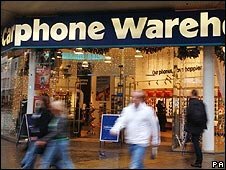 The company's founder Charles Dunstone wants to break up Carphone Warehouse as part of an overhaul of the company. He said the firm was at a "watershed" and announced a corporate review. The comments came as the company reported an interim net profit of £39m ($58.7m) for the six months to 27 October, down from £44m a year earlier. Mr Dunstone said: "We recognise that the structure of the group may now no longer be appropriate for the optimal development of the two businesses. "The board has therefore initiated a formal review of the group's corporate structure and capital requirements, which may lead to a separation of the two businesses." An update on the review's progress will be made in spring 2009. The move comes six months after Carphone sold a 50% stake in its retail business to US electronics firm Best Buy for £1.1bn. "All in all, 2008 has to date proved a transitional year for Carphone Warehouse," said Keith Bowman, equity analyst at Hargreaves Lansdown Stockbrokers. "The growth in consumer spending which Carphone has benefited from has now evaporated, although the group has gained significant economies of scale via its joint venture with US electrical retailing giant Best Buy."